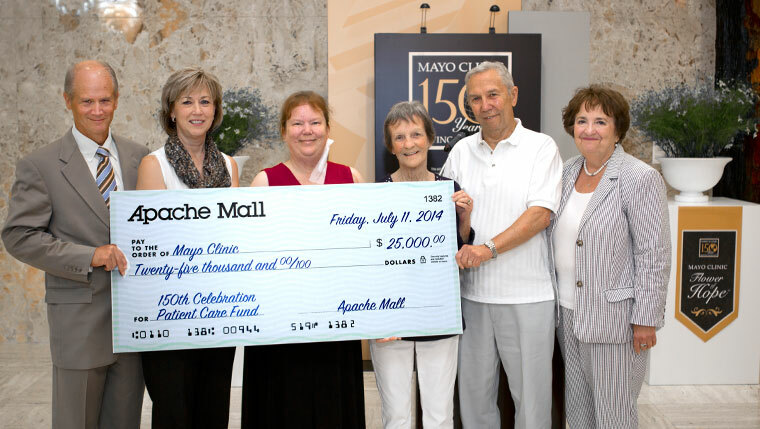 Apache Mall presents a check for the Mayo Clinic Sesquicentennial Patient Care Fund. Pictured above, Kerry Olsen, M.D. ; Kim Bradley, Apache Mall; Cynthia Suhr; Jane and John Collins (Cynthia’s parents); and Carole Stiles, Medical Social Services. During planning for Mayo's Sesquicentennial, a survey went out to staff asking for their thoughts on how Mayo could best celebrate 150 years of patient care. The responses, according to Kerry Olsen, M.D., had nothing to do with cake, ice cream or parties, but had everything to do with helping those we serve each and every day. (Imagine our lack of surprise.) "The one thing we heard over and over again was, 'Do something to try to help our patients and their family members," Dr. Olsen says. So Mayo did just that, creating the 150th Patient Care Fund, to support patients and families who need help with personal expenses (food, lodging and such) during their time at Mayo Clinic. The fund is, for lack of a better word, funded by donations from both patients and staff, as well as from Sesquicentennial merchandise sold in Mayo's gift shops. And by the upcoming Healthy Human Race, which will donate all net proceeds directly to the Patient Care Fund. And by local businesses, such as Apache Mall in Rochester, which earlier this month became the fund's largest contributor, when manager Kim Bradley handed a check for $25,000 to Dr. Olsen during a ceremony covered by several local media outlets. Mayo Clinic patient Cynthia Suhr was part of that ceremony and shared the story of how the fund helped her after a cluster of epileptic seizures landed her at the Saint Marys campus of Mayo Clinic Hospital for an extended period. "I ended up being in Saint Marys longer than I expected," Suhr told the crowd. "And while I was in there, my insurance lapsed." Before she was discharged, Suhr says she spoke with a medical social worker at Mayo about concerns she had over paying for her seizure medication without insurance. "My seizure meds costs between $700 and $800 a month, and I only earn about $900 a month," she says. Suhr says her case worker was able to help her "fill out some forms" and "get some immediate assistance" from the fund to help cover the cost of her medication. "I would like to thank everybody who was able to help me with that," she says. And that, Dr. Olsen said during the ceremony, is what it’s all about. "When you hear the stories about how this fund is helping people, it is truly heartwarming," he said. You can watch video of the donation ceremony here. (Requires Mayo intranet access.) Then, be sure to warm our hearts by sharing your comments, and this story, with others.